In collaboration with Brinkley Sargent Architects and Moody Nolan, Counsilman-Hunsaker designed the outdoor recreation pool for the new 51,000 sq. ft. Bruce and Graciela Redwine Student Wellness Center. Located on the edge of campus and bordering a main thoroughfare, the wellness center serves as a high-visibility facility for the university while aligning with the style, scale, and materials of the existing campus buildings. The wellness center includes a fitness center, group exercise rooms, fully equipped gymnasium, indoor cycling, and juice bar. 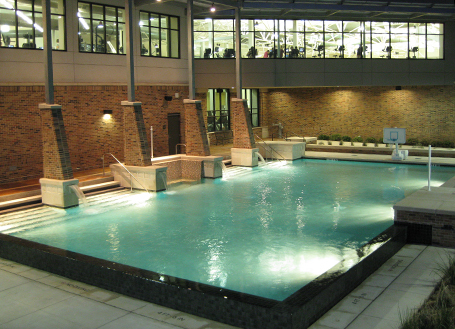 Students are greeted into the aquatic facility with a view of a pristine lake, while the infinity edged leisure pool, with its multiple sheer waterfalls invites students into a relaxing, leisurely swim. Students also enjoy playing beach volleyball and outdoor basketball, watching movies, and cooking on the grills at this innovative aquatic facility.